Over quite a few years of garden, woodland and estate work I have come to appreciate old tools. They are nearly always well balanced and well made. Buying and restoring old tools has become an obsession, and a small business. More about my tools can be found in this article from Reclaim Magazine. To see a good range of my stock please visit me at a show. Tools for the woodland and timber trades are what personally interests me most. I particularly like billhooks, ("handbills" if you are Sussex, and of a certain age) and always try to keep a good selection of them, along with drawknives, axes etc. Please enquire if you have any specific tool requirements - if not in stock I can look for items without placing you under any obligation to buy. Augers and brace and bits are another minor obsession. I can sharpen these, and try to keep a range of different patterns and large (>1") sizes. Repairs to your own tools can be carried out by arrangement. In most cases you can find prices on my repairs page. I've recently learned that my tool repairing could be dignified by the term re-manufacturing, and is part of the circular economy - but as far as I'm concerned fixing tools is just common sense! I'm often asked why some modern tools break, I've written a few notes on the subject. Very occasionally I may have blacksmith made edge tools. There was a strong tradition in the Sussex Weald of locally made tools, many of superb workmanship and quality. These are now hard to find, are getting pricy, and very much sought after. For example I am still occasionally asked for the tools of J. Fenner of Boars Head, he stopped work in the 1970s. Link to a series of pictures of me re-handling billhooks at the SSCG Open Day. I have compiled a list of books on tools and the items made with them. 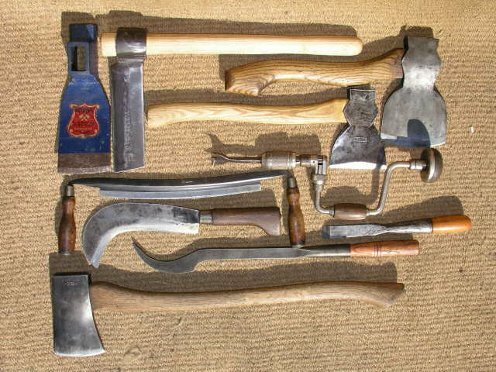 A collection of coopers' and other woodworking trade tools. G and M Tools, Ashington.